At Trilogy Mortgage, we want to assist California home buyers achieve their homeownership goals through financing that works for their purchase needs and their budget. Our California Jumbo Loans are designed to finance high value property that is priced beyond conforming limits. 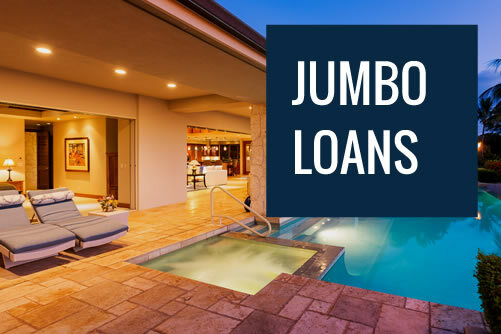 With our Jumbo Loan options, buyers can have more borrowing power – and with multiple term options, each borrower can determine the best Jumbo Loan solution for their finances. Call us today at (800) 939-4177 to learn more. WHY CONSIDER A JUMBO LOAN? Jumbo Loans from Trilogy Mortgage are designed to help California home buyers finance higher priced homes that are valued above area loan limits. The Federal Housing Administration will only finance loans up to certain amounts. These loan limits vary by location. Since California is known to have higher-than-average real estate prices, the state’s loan limits tend to be higher as well. However, even with higher loan limits, California still has plenty of high value real estate that is listed for prices above conforming limits. Want to know more? Call us today at (800) 939-4177. At Trilogy Mortgage, we offer a selection of Jumbo Loans to suit a variety of buyers interested in high value real estate. Choose a 30 Year Fixed Rate Jumbo for a longer term to help keep payments low. Or, if you don’t plan to live in the home more than a few years, consider a 5/1 Jumbo ARM to enjoy a low rate for the first five years of the mortgage. Other options are available, so be sure to speak with one of our loan professionals to compare California Jumbo Loan features. Jumbo Loans are for homes priced above conforming loan limits for the area. They may have slightly higher interest rates, as they are much larger loans and tend to carry more risk. They can be offered in fixed or adjustable rate terms. Contact us today to get started on your California Jumbo Loan application. We’re here to help you through the whole process, from prequalification to closing! Call us at (800) 939-4177 or complete the electronic form on this page and one of our loan professionals will reach out to you.